This 30-minute veggie-friendly meal makes a quick-and-easy weekday dinner: Gingery Butternut Squash and Tofu Curry. Curry adds spice to the dish, and may even help curb inflammation. It's a great flavor for stir-fry, for instance, because it doesn't have as much sodium as other ingredients, like soy sauce. This 30-minute veggie-friendly meal makes a quick-and-easy weekday dinner: Gingery Butternut Squash and Tofu Curry. Curry adds spice to the dish, and may even help curb inflammation. It's a great flavor for stir-fry, for instance, because it doesn't have as much sodium as other ingredients, like soy sauce. The butternut squash is rich in antioxidants and complements the curry flavor in this less-than-300-calorie dish. You'll also get a boost of protein from the tofu and plenty of vitamin C and folate from broccolini. Punch up the fiber by serving over brown rice instead of jasmine rice. 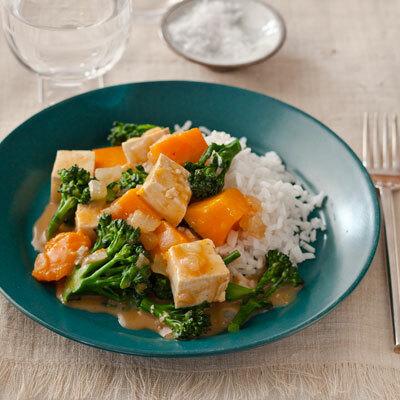 Ingredients: Butternut squash, olive oil, onion, curry-style simmer sauce, milk, water, firm tofu, broccolini, jasmine rice.